I didn’t know who Markos Moulitsas was when I first met him in June 2003 at a “Howard Dean for President” house party in Berkeley. My co-host Matthew introduced him to me, and told me that he had invited Markos and his wife to attend our event. Markos, he said, was the creator of Daily Kos, a liberal blog (short for “web log”) that tracks national politics, organizes party activists, and raises funds for Dean and other insurgent Democratic candidates. Within a week, Howard Dean’s online-driven donations propelled him into front-runner status. Within a month, I became an obsessive reader of Daily Kos. By collecting underreported stories in the media, newly released public opinion polls, and insightful commentary by dozens of contributors, Daily Kos is always my first stop for reading the latest political news. Today, Daily Kos gets over one million unique visitors each day, and along with blogs like MyDD.com has become a new force in monitoring the media and building the Democratic Party. So when Moulitsas and Jerome Armstrong of MyDD.com announced on their blogs that they were writing a book about the Democratic Party, I was one of the first to pre-order a copy online. 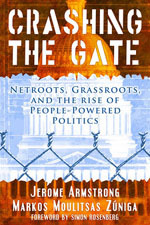 Crashing the Gate: Netroots, Grassroots and the Rise of People-Powered Politics won’t officially be launched until March 27, but it has already sold over 5,000 copies from dedicated “Kossacks” who paid for it months before its release. I tried to approach this book with a dose of skepticism. The Internet undoubtedly plays a huge role in how we communicate, but how many people really have time to read political blogs? To what extent is the liberal blogosphere really just an online circle jerk of self-important political junkies? Websites like Moveon.org have been effective at mobilizing everyday activists, but when does the blogosphere lose sight of good old-fashioned street-level organizing in the “offline” community? While I respect (and agree with) many bloggers who argue that the Democratic Party should contest every single election and fight Republicans on their own turf, they haven’t had the best track record yet. In the 2004 election, readers of Daily Kos and MyDD.com were deluged with stories about Senate candidates in Oklahoma and Alaska who went down to defeat on Election Day. Today, the blogosphere obsesses about Montana’s new governor, Brian Schweitzer, and how one of the best pick-up opportunities for Democrats in 2006 is the Montana Senate race. To what extent are they being delusional? Crashing the Gate could have degenerated into a rambling, insular, self-congratulatory testimonial about how liberal blogs have changed politics. Instead, Moulitsas and Armstrong have written a lucid, concise, and deeply insightful book that exposes the Democratic Party as a moribund Beltway-centered apparatus stuck in neutral with greedy consultants, old campaigning tactics that no longer work, and party elites who grasp their ever-shrinking fiefdom and resist anyone who dares to challenge their authority. It’s often said that the Republicans are a party – but the Democrats are a bunch of interest groups. Moulitsas and Armstrong begin by persuasively showing how labor, environmental and pro-choice organizations have missed the forest for the trees as they demand a purist electoral agenda that hurts all their causes. The answer is not for Democrats to “sell out” these groups, but to build coalitions among them to ensure that we don’t sabotage each other’s goals. In 2004, for example, four major donors in Colorado got the progressive stake holders all in one room, and set up two 527-organizations that allowed these groups to collaborate on a common project without sacrificing their own causes. The result was a rare, decisive statewide victory for Democrats that November. The book gets even better when Moulitsas and Armstrong explore the world of Democratic political consultants who get paid exorbitant amounts of money to lose elections. The consultants, they explain, get paid on commission based upon how frequently their television commercials run — even if the ads are bland, not memorable and inundate voters with emotionless facts. Republicans, on the other hand, produce ads that tug at voters’ heartstrings, driving them to vote out of fear, anger or patriotism. In 2004, where millions of small donors wrote checks to the Kerry campaign in hopes of defeating George Bush, the Democratic Party had an obligation to put their money to good use. Instead, consultants sold them out, cashed in and moved on to the next campaign where the same thing will happen all over again. But the most fascinating part of Crashing the Gate is when Moulitsas and Armstrong argue that campaign finance reform created an opening for ordinary folks to take back the Democratic Party. Before 2002, Democrats largely relied on million-dollar checks of “soft-money,” while the Republicans had a more extensive network of small contributors. The McCain-Feingold legislation changed all that, and for a while Party leaders panicked because their major source of funding was gone. But Howard Dean’s insurgent campaign prompted a new direction, as the Internet produced thousands of new small donors who now can potentially control the Democratic Party. Today, liberal blogs effectively use their vast network of small donors to target races where a little extra money can make a huge difference. In August 2005, the liberal blogosphere funded $500,000 out of the $850,000 that Paul Hackett spent to almost win in a congressional district that the Democratic Party had hopelessly written off, with nearly 9,000 people giving $50 each. By the time Crashing the Gate starts praising the work that blogs like Daily Kos and MyDD.com have done, Moulitsas and Armstrong have earned enough respect from the reader that their praise is well deserved. Moulitsas and Armstrong get enormous credit as pioneers of the liberal blogosphere, but the strength of their blogs (as they gladly point out) is that anybody can participate. Liberal activists everywhere can join the Daily Kos community, post comments, research online, and use the blog to hold the media accountable. The power and influence of these blogs derives from the fact that there are no leaders, and it thrives on communication between activists to mobilize support and activate the online grass-roots community. As Moulitsas and Armstrong argue at the beginning of the book, Republicans don’t know how to govern – but Democrats don’t know how to get elected. With the help of the liberal blogosphere, we can hope to change the latter. Read Crashing the Gate and you’ll understand why.